What do you think about our attitudes towards difference? The clear narrative emerging from the audience responses to the performances is that society has, at best, a complex, ambiguous relationship with difference, and at worst, a damaging, divisive and negative attitude. For some watching the performances, this negative attitude had been improving (and some older respondents pointed out the changes in their own lifetime) but the present political and economic climate of cuts, austerity and changes to welfare threatened to stifle or reverse any progress, with more needed to be done. 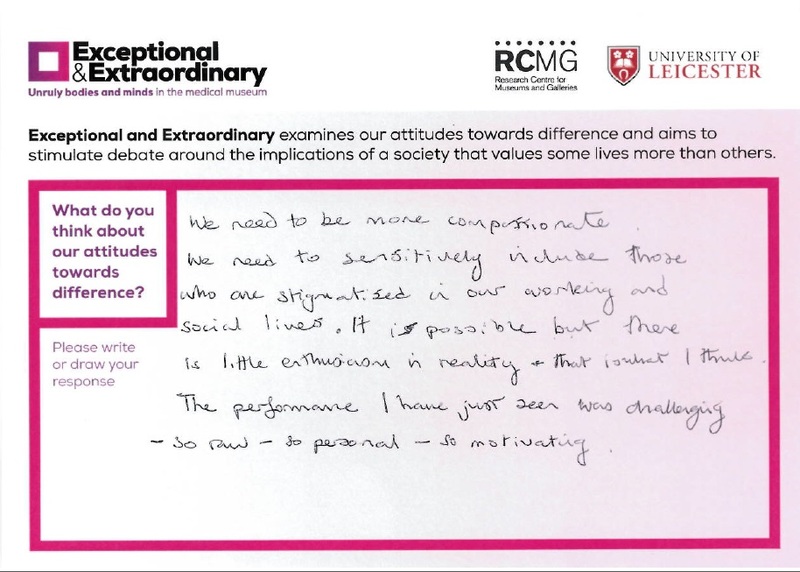 More excitingly, respondents thought about how these negative or ambiguous attitudes could be changed or challenged, which to a significant degree reflected the aims of Exceptional & Extraordinary. 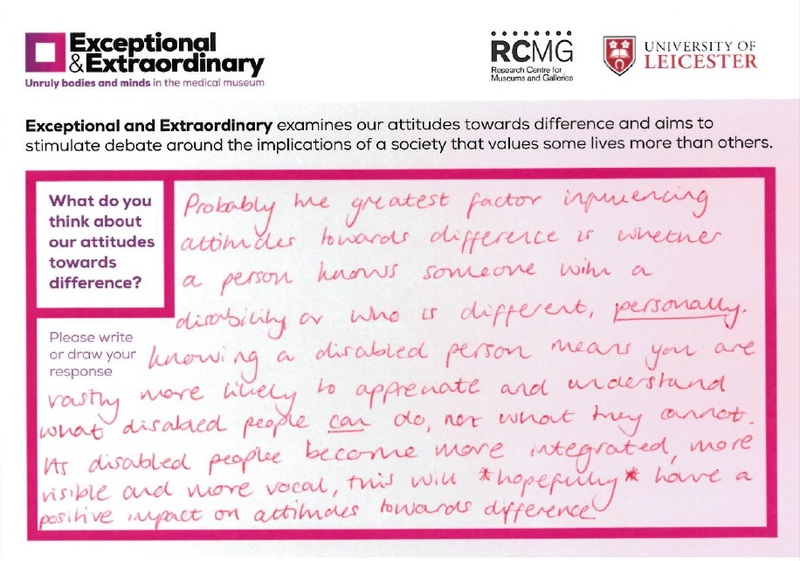 Greater exposure to the lived, authentic experience of disabled people and the need for education around diversity and difference, as well as better integration of disabled people into society, were put forward as solutions. Respondents talked about being ‘blown away’, of being ‘shocked’, provoked and moved by the experiences portrayed on stage and screen. Their power was directly connected to the authentic, lived experiences of disabled people told by disabled people, through the museum collections and stories. Some people talked about having their eyes opened, or used the performances to reflect on their own experiences and professional practice, detailing how the performances would affect their thinking and work as a result. 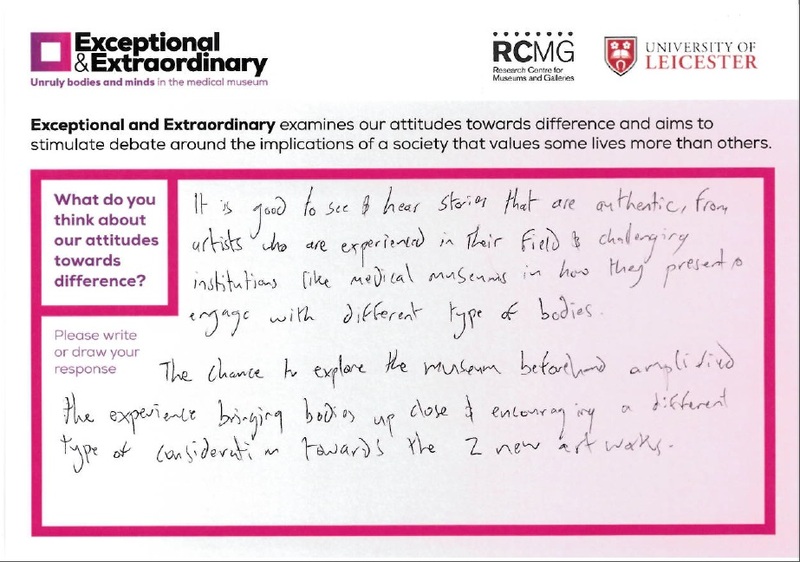 Audiences also considered that museums could do much more to openly challenge ideas around ‘normal’ and difference and could play a role in contributing to a more diverse, accepting society that embraces and celebrates all types of difference as a fundamental part of human nature. Exceptional & Extraordinary Audience Engagement and Response Report outlines the findings from Exceptional & Extraordinary audience research. 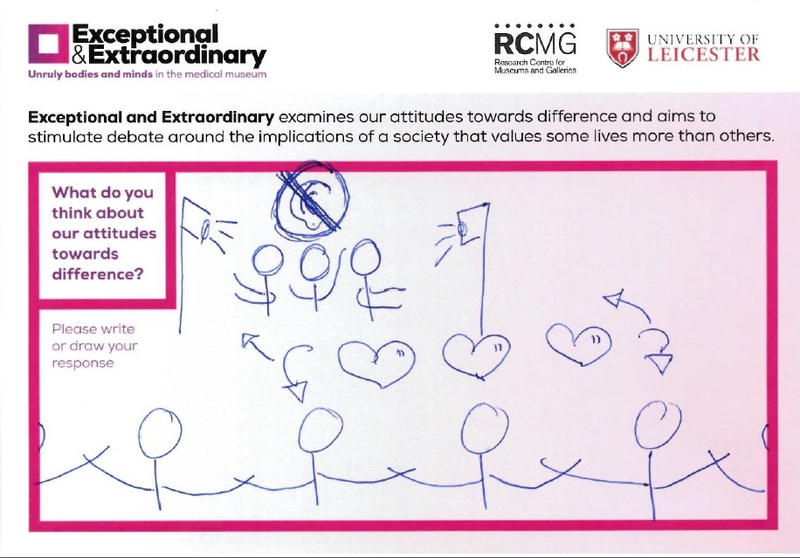 The research explored the following questions: How do audiences respond to and engage with the ideas at the heart of Exceptional & Extraordinary? How do the artworks impact on audiences’ thinking and attitudes about difference? Appropriating the style of contemporary artist David Shrigley, whose work often comprises irreverent, subversive and humorous cartoons, in this drawing we see depicted a crowd of happy circular-shaped characters, and two unhappy characters marked out as different and separate from the group. This simple, but visually graphic response powerfully highlights the emotive issue of society’s negative attitudes towards difference and the potentially devastating impact on identity. Jessica, who works at a museum and watched Julie McNamara’s and David Hevey’s newly commissioned works, believed strongly that society’s attitudes towards difference is affected by their personal experience and relationships. She advocated for and recognised the importance of visibility. This reflects the power of the performances in conveying complex ideas and enabling audiences to encounter the real, lived experience of disabled people, to enter their worlds and understand from their perspective. This simple, but thought-provoking comment powerfully presented a key underlying issue in society in relation to disability- we have been conditioned to fear difference. 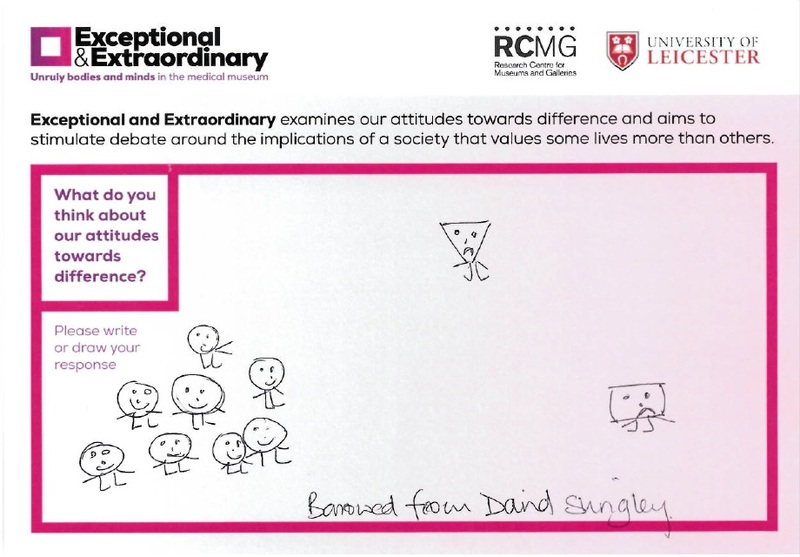 Responding to the Exceptional & Extraordinary event at the Royal College of Surgeon’s this audience member asked us to question these ingrained negative assumptions and perceptions. 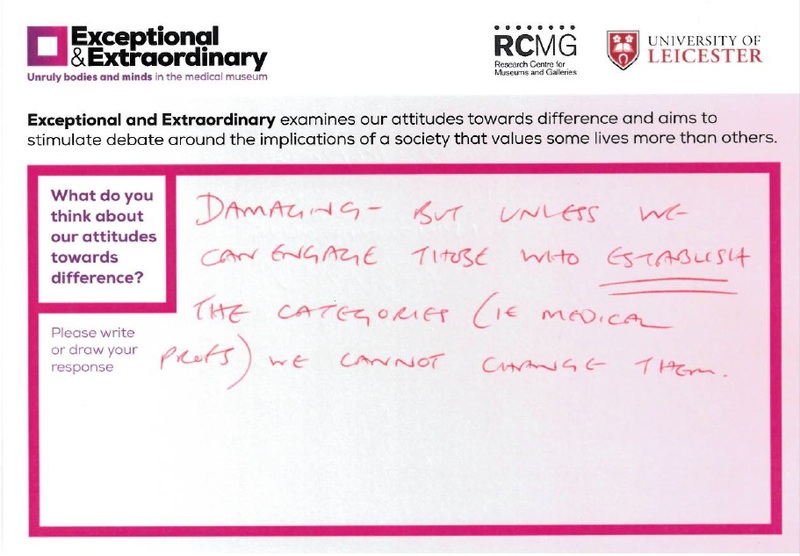 This response captured after watching Julie McNamara’s ‘Hold the Hearse!’ and David Hevey’s ‘The Fight for Life’ at the Royal College of Surgeons expressed a complex understanding of the impact of medical categorisations and how deeply embedded these views are in our society which can lead to creating profoundly damaging attitudes towards disabled people and difference. 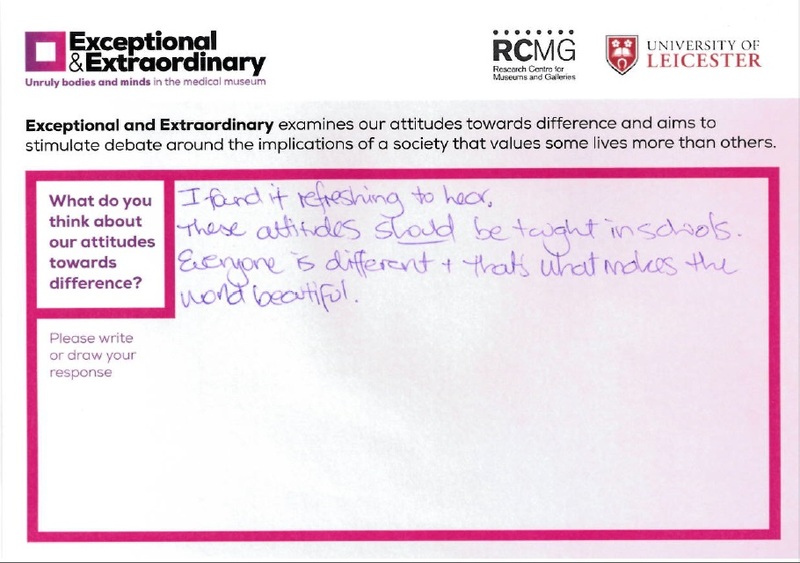 After experiencing ‘The Wobbly Manifesto’ and ‘Let Us Tell You A Story’ at the Royal College of Physicians, this audience member confidently expressed their views on how society’s attitudes towards difference are shaped. Understanding today’s society to be materialistic and one that values economic worth over and above a moral and spiritual compass, they reflected on how our current societal structures and systems have had a profound impact upon how we think about and value difference. Liz, a mum of two daughters aged 3 and 5 years, reflected on her children’s views of difference. Through her comments she demonstrated that judging difference negatively is a learnt behaviour rather than innate to human thinking. She hopes for a changed world for both her and her children, where plurality is embraced, and difference is celebrated and valued. 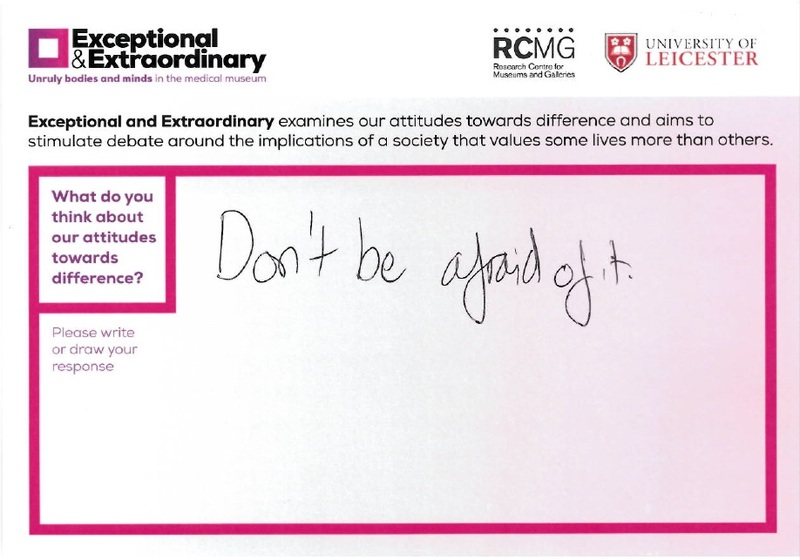 Ann saw Francesca Martinez at the Thackray Museum and was clearly inspired by her ‘Wobbly Manifesto’ voicing a need for self-acceptance and emphasising the importance of individual action and activist practice in actively challenging negative or divisive attitudes towards difference. The Deaf Men Dancing performance of ‘Let Us Tell You A Story’ at the Thackray Museum inspired this creative, visual response from a 14 year old audience member. Echoing the visual nature of sign language her drawing suggests a sense of love, empathy, understanding and a two-way communication between the three spotlighted dancers and the united audience members. An audience member from Australia, identified that the attitudes and perspectives presented in Francesca Martinez’s and Deaf Men Dancing’s performances are not widely heard or seen. She acknowledged a need and aspiration for these significant messages to be shared more widely, suggesting that empathy and kindness could be learnt in schools and fear of difference challenged through education. Francesca Martinez’s Wobbly Manifesto at the Science Museum resonated with Emma’s personal experience of difference and disability. 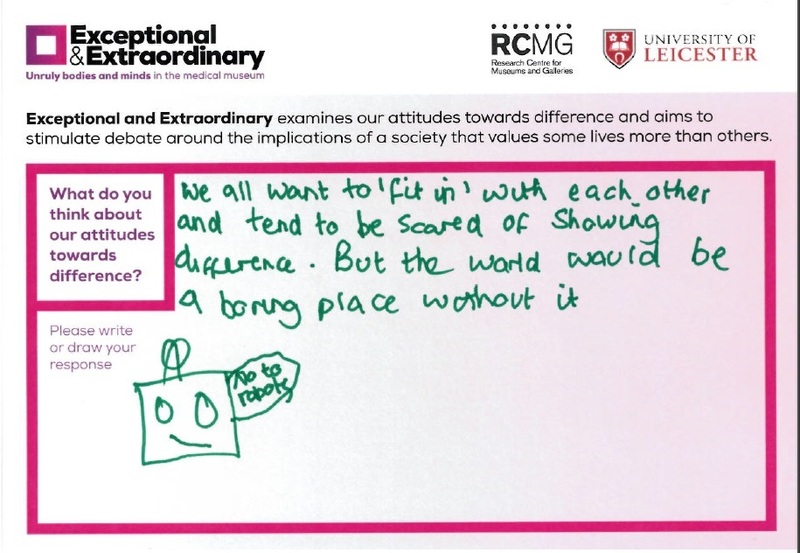 Describing herself as a fellow Wobbly, she has a profound sense of how society operates and through her humorous drawing “No to robots” and written reflections she expresses a desire to “fit in”, yet recognises how dull the world would be without difference. 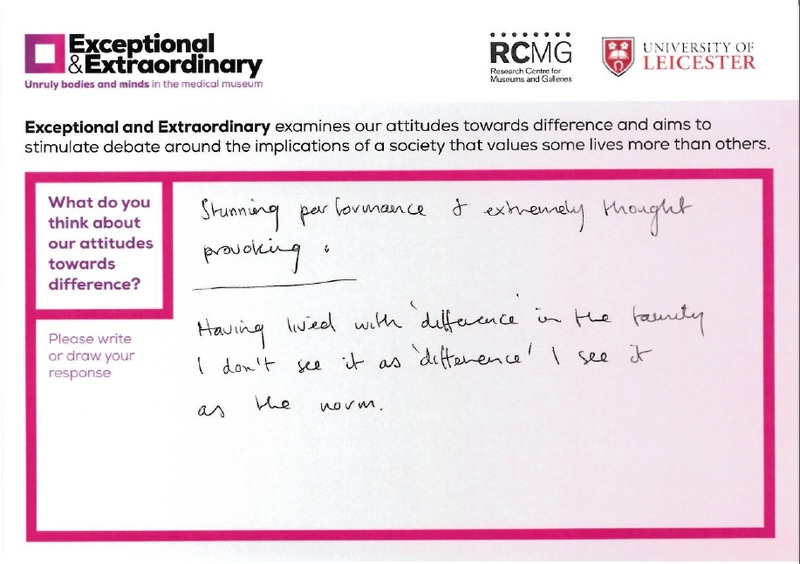 The performances inspired respondents to think about how we as individuals and a society can change, influence or challenge negative attitudes towards difference. This comment also emphasised the importance of being exposed to difference and building relationships that will, in turn, confront ignorance. 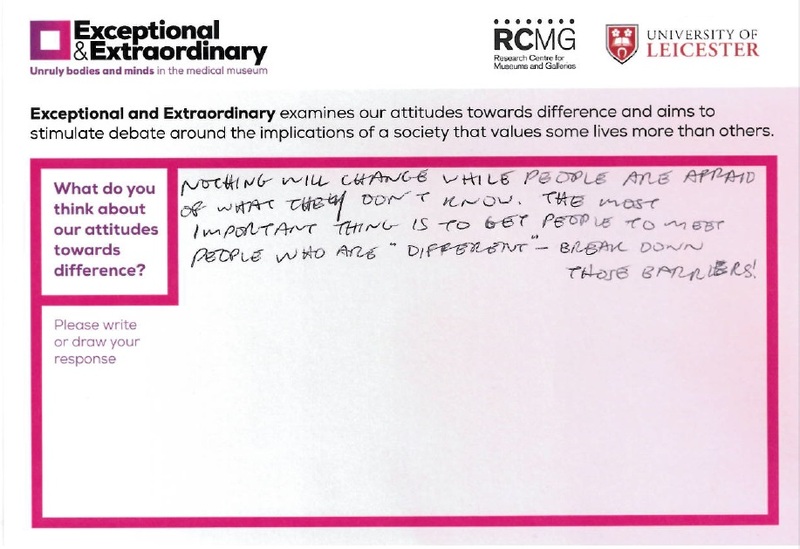 By getting to know people and understanding their lives, needs and interests, individuals and society can become more open to accepting people who are ‘different’. Not many respondents chose to talk about the broader impact of stigmatising difference in working life, as well as social life, but this respondent was one of the exceptions. Having viewed ‘Hold the Hearse!’ at Bethlem Museum of the Mind they passionately articulated Julie McNamara’s work as thought-provoking, emotive and provocative, which led them to raise the question – where is the motivation in society to become more compassionate? 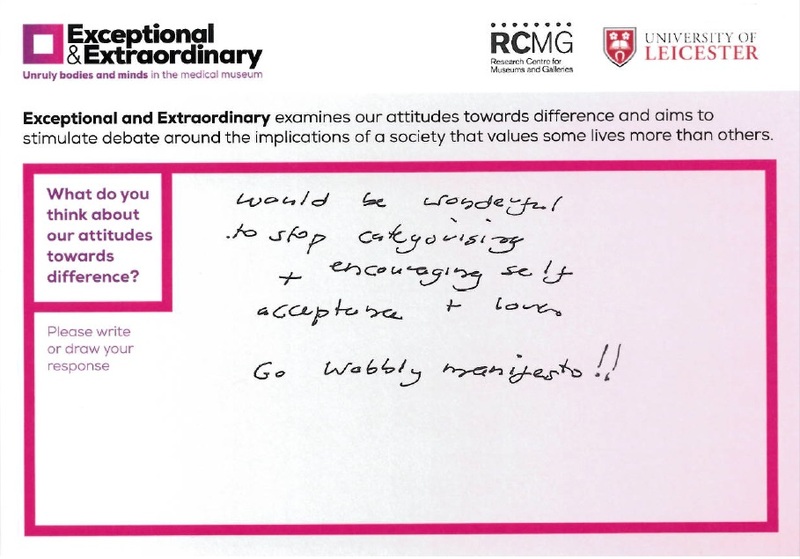 These positive comments and reflections on the Exceptional & Extraordinary event at Surgeons’ Hall Museum, simply, but powerfully highlight issues surrounding what it means to be ‘normal’, reflecting a personal experience of difference they challenge and question society’s concept of ‘normality’. 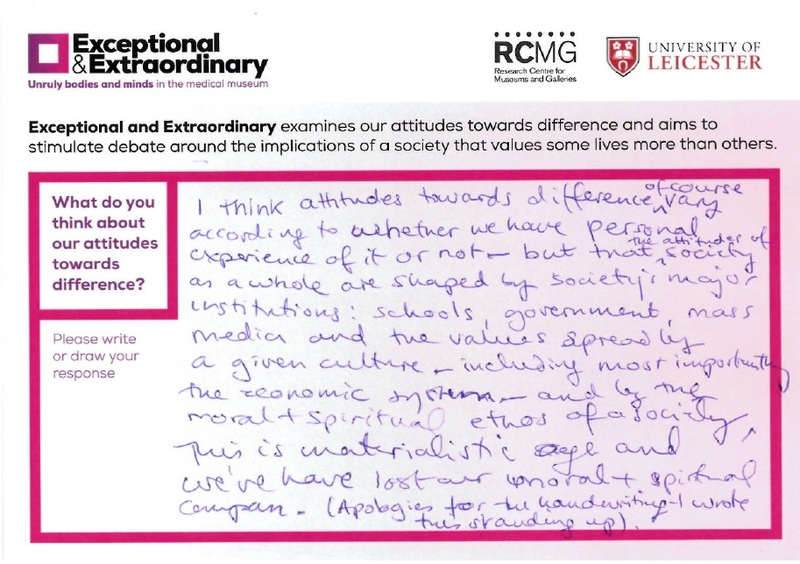 Although the response card did not directly ask for comments on the museums, this audience member suggested the role museums might play in portraying, negotiating or challenging societal views of difference. Seeing and considering the different types of bodies in Surgeons’ Hall Museum Collection also impacted upon and enhanced their interpretation of the two newly commissioned artworks by Mark Smith of Deaf Men Dancing and David Hevey. The power of the performances was directly connected to the authentic, lived experiences of disabled people, told by disabled people through the museum collections and stories. 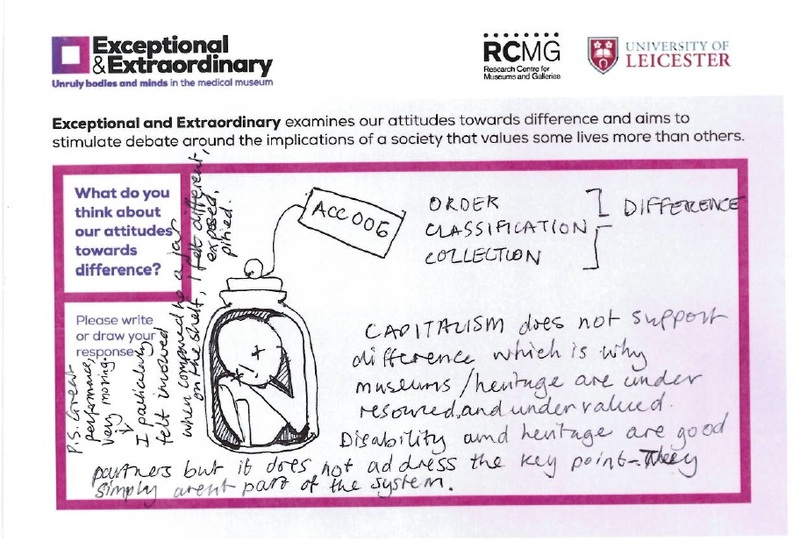 Amy, aged 27 years, who saw ‘Hold the Hearse!’ at Langdon Down Museum candidly engaged with museum practices of order, classification and collection revealing a history of specimen culture rather than seeing the human stories. She also considered that museums are not able to effectively address issues of representation and difference, because of the social, political and economic context which does not value difference, with a lack of funding in particular severely restricting what museums are able to do.